Bodhgaya, Bihar, India – The sun was shining over the top of the Mahabodhi Stupa into the yard of the Tibetan Temple as His Holiness the Dalai Lama left for the Kalachakra Maidan this morning. As has become his custom, he stopped at the front of the stage to greet the audience. Laughing, he teased the more than 500 Mongolians by imitating the way they wave their silk scarves in the air with both hands. Once again he took his seat before the small pavilion housing a painted mandala to prepare himself to give the Avalokiteshvara empowerment. Nearly an hour later His Holiness was seated on the throne when a mixed group of Koreans gently recited the ‘Heart Sutra’ in Korea to the steady beat of a wooden fish bell which they call a ‘moktak’. A group of Vietnamese monastics and lay people then repeated the ‘Heart Sutra’ to a poignant, lilting chant in Vietnamese. “Over the last three days we’ve listened to recitations of the ‘Heart Sutra’ from different countries where people have been repeating it for more than 1000 years—they are long established Buddhists. After his enlightenment, the Buddha taught the Four Noble Truths and so forth, and his teaching spread across Asia. Times have changed, but still people have by and large retained their religious traditions. His Holiness began the process of the empowerment which starts with making an offering to potentially interfering beings and asking them to leave. He expressed reluctance about asking them to leave because so-called interfering beings too are beings who like us seek happiness and do not want to encounter suffering. 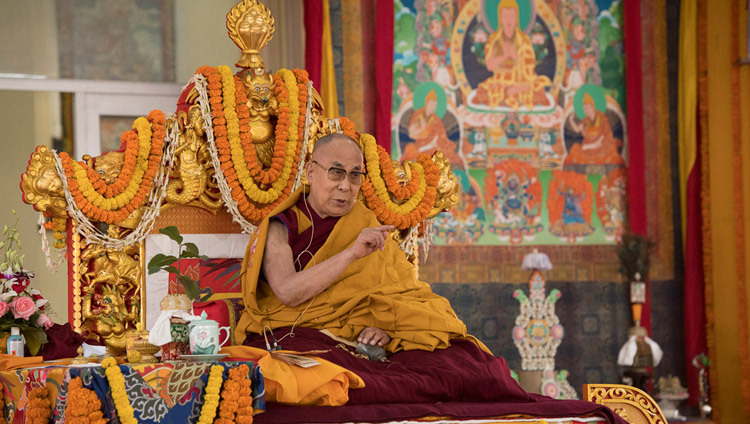 He remarked that since Bodhgaya is an extraordinarily special place it’s appropriate to cultivate the essence of the Dharma, the awakening mind of bodhichitta here. He recommended we train our minds as outlined in the mind training texts, thinking of sentient beings as kind like our mothers, remembering their kindness and seeking to repay it. At the same time, he said, it’s useful to reflect on the disadvantages of the self-cherishing attitude and the advantages of cultivating concern for others. His Holiness mentioned that other countries following the Sanskrit tradition of Buddhism tend to have a relationship with Avalokiteshvara in the form of KuanYin. The crucial thing is not so much the form of the deity or the number of heads and arms he or she has as that they embody the essence of compassion. Chandrakirti acknowledges the importance of compassion when he salutes it at the beginning of his book, ‘Entering into the Middle Way’. Compassion is a state of mind unable to bear the sufferings of others. 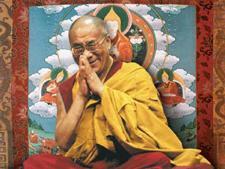 If we had more compassion, His Holiness cautioned, there would be more peace in the world. “Avalokiteshvara has a special connection with the people of the Land of Snows and with our neighbours as well,” His Holiness noted. “I received the empowerment of this 1000 armed, 1000 eyed Avalokiteshvara for the first time from Tagdrak Rinpoche. Later, I received it again from Ling Rinpoche in Dromo. I have recited more ‘manis’ than any other mantra—I say it daily. This, and my cultivation of bodhichitta, are part of my offering of practice. During the early part of the empowerment, His Holiness not only gave the bodhisattva vow again, he led the audience through the ‘all-encompassing yoga’. As he completed the empowerment, he acknowledged that it had been requested by Namgyal Monastery, which was founded by the Third Dalai Lama, Sonam Gyatso. People from Mongolia were co-sponsors of the empowerment and the teaching. The empowerment was followed by the conducting of a Long-Life Offering for His Holiness at the behest of Namgyal Monastery and the Mongolian group. At the point where His Holiness was offered a huge ritual cake, the Mongolians proffered a carefully arranged heap of kap-sey topped with cheese. Lama Gegeen recited the citation for the mandala offering, which surveyed His Holiness’s achievements on behalf of Tibetans, but also touched on the support he has given Mongolians, including his staunch discouragement of the practice of Shukden. The occasion was brought to an end by the spirited performance of a group of Mongolian musicians, which enthralled the audience. His Holiness thanked everyone who had participated in making the Long-Life Offering to him, telling them that the power of their faith and sincerity would surely be effective. He especially thanked the Mongolians who had made such efforts to attend. As some of the audience contemplate returning home, he advised them to go calmly in peace, to think of dependent arising and to say, ‘Om mani padme hum’. Towards the end of the afternoon, Chief Minister of Bihar, the Honorable Nitish Kumar paid His Holiness a courtesy call in his quarters on top of Ganden Phelgyeling Monastery.